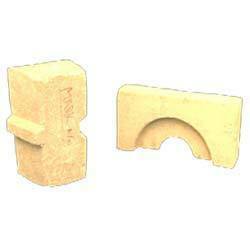 We offer a wide range of pre-cast-pre-fired insulating shapes bricks. Pre-cast-pre-fired Insulating Shape-1 can produce six grades of insulating firebricks with limiting temperatures range lying between 1260°C to 1790°C. Each grade is formulated to meet specific thermal and physical requirements. Each brick is produced in compliance to requisite tolerance level on all six faces. Established in the year 1982, Achint chemicals has pioneered refractory production in India. We are ISO 9001-2008 Certified Company. Manufacturer of Refractory Insulating Bricks, Insulating Castables and Mortar. Ours SSI unit located at Beran, Bhilwara, Rajasthan India. Our Annual Production 4.8 M Insulating Bricks.